You are in a rush, you are starving, and you want food NOW! All is not lost though. You keep your cool and rather than grabbing for the nearest bag of Combos, you decide on a protein bar instead. But which brand do you reach for? Are all protein bars the same? Today we are going to take a look at a small glimpse of the various options to choose from in the world of protein bars. My Prerogative – What Do I Look for in a Bar? When I choose a protein bar I have certain stipulations, based upon my goals. Calories – I want a bar that is low in calories, while keeping in mind the total weight in grams. Protein bars don’t exactly fill me up, no matter how many calories they bestow, so I treat them more like a snack than a meal. What can I say? I am a real food kind of girl. I stay away from the 400-500 calorie behemoths and stick to the 200 calorie range. I also look for the biggest bar that I can get for that calorie range. I hate when you buy a protein bar thinking that it is going to at least tide you over until you next meal, only to unveil it from it’s wrapper and realize that it’s a two bite wonder. Protein – The higher the protein content, the better. Sugar – The lower the sugar content, the better. Fiber – Most bars have at least 3 grams of fiber. The higher the better. Taste – Obviously, I want a bar that is going to taste good. I realize I am not going to get 5-star, knock-your socks-off decadence here, but I am not too picky when it comes to protein bars, so I am pretty confident that as long as it has chocolate in the flavor name, I will be happy. Ingredients – Here is the doosey that most people skip over. What the heck is in the bar? I want a bar that doesn’t have a lot of fillers and ingredients that I cannot pronounce. I want whole, organic ingredients. I want nutrients and minerals, things that I know are good for me and will nourish my body. I want a bar that is going to help regulate my blood sugar levels, and not send me soaring only to crash. 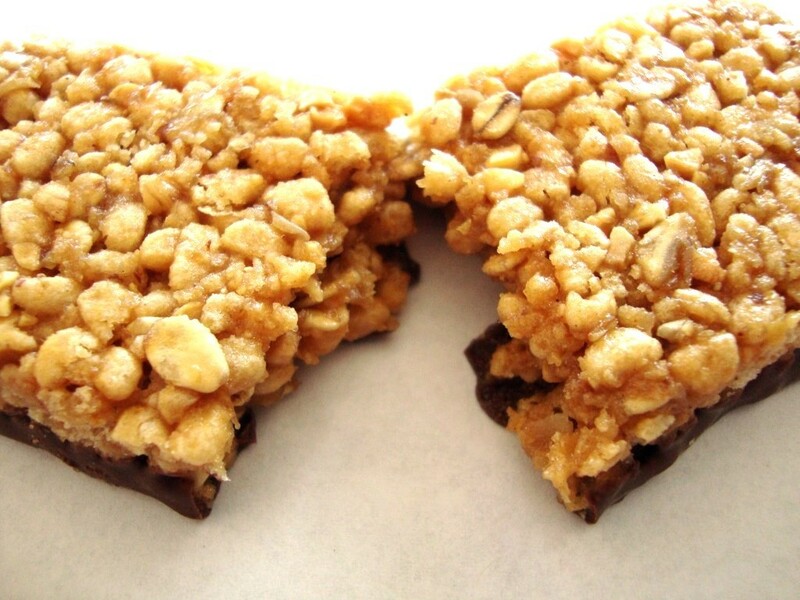 So without further adieu, let’s take a look at some of the most popular protein bars. Note: I only picked bars that I think taste good, so I won’t factor “taste” into the mix. Label Claims: Low glycemic, high in calcium and folic acid, rich in antioxidants. LunaPro™ (soy rice crisp [soy protein isolate, organic rice flour], organic toasted oats, organic roasted soybeans, organic soy flour, organic flaxmeal), organic brown rice syrup, organic coating (organic evaporated cane juice, organic palm kernel oil, organic cocoa, organic soy lecithin, organic vanilla), marshmallow flavored nuggets (organic evaporated cane juice, cocoa butter, oat fiber, oat flour, fructose, natural flavors, gum arabic, soy lecithin), inulin (chicory extract), vegetable glycerin, organic soy butter, organic sunflower oil, natural flavor, sea salt. Pros: Organic, mostly whole ingredients, low in calories (3.75 per gram), fair amount of protein, good amount of fiber, low in sodium, lots of vitamins and minerals. Cons: Contains quite a bit of soy, which some people (me) are sensitive to, i.e. stomach discomfort, problems digesting, etc. Also, it is a little small in comparison to other bars, but then again it is lower in calories as well, so it all equals out. Label Claims: Excellent source of protein, excellent source of calcium, good source of fiber, all natural. Caramel (corn syrup, sugar, high fructose corn syrup, nonfat milk, fractionated palm kernel oil, cream, milk protein concentrate, natural flavor, salt, soy lecithin, disodium phosphate), soy protein nuggets (isolated soy protein, tapioca starch, salt) milk chocolate flavored coating (sugar, fractionated palm kernel oil, nonfat dry milk solids, cocoa powder, soy lecithin, salt, natural flavor), corn syrup, gum arabic, guar gum, glycerine, sodium caseinate, peanuts. Less than 2% of the following: water, sunflower or safflower oil, soy protein isolate, natural flavor, salt. Pros: High protein, good amount of fiber, good size bar in grams, contains vitamins and minerals, fairly low in calories (4 calories per gram). Cons: Yikes, corn syrup is the first ingredient!, mostly fake ingredients, lots of sugar, no organic. My Vote: D, there are much better options than this. Candy bar in disguise! !